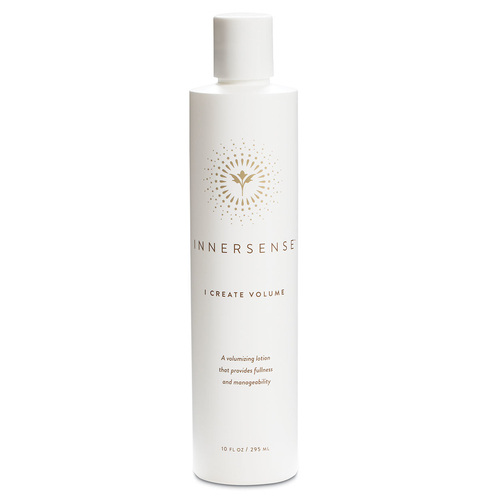 The Innersense Organic Beauty I Create Volume adds a look of instant dimension and structure from roots to ends. Bring back the appearance of lift, volume, and texture while leaving behind a soft matte looking finish. Natural botanicals in this hair volumizing lotion visibly improve elasticity and shine, while antioxidants make hair feel protected and resilient. To create the appearance of texture, apply on damp hair and distribute throughout hair using a comb or brush. Blow dry and style. To create a volumized look, apply to the base of hair and blow dry as usual. Tip- To enhance your hair's natural beauty, spray on damp hair, allow hair to air dry, then use hands to break up and disperse product throughout, creating a textured and volumized look. Water, Aqua- EAU, Organic Aloe Barbadensis Gel, Cyamop-sistetragonolobus (guar) gum,* sorbitol, sclerotium gum, Organic Citrus Aurantium Dulcis (Orange) Fruit Water, Organic Wheat Grass*, Organic Rooibos African Camellia Sinensis Leaf Extract**, Organic Honey Extract*, Rice Amino Acids, Organic Chamomilla Recutita (Matricaria)* Flower Extract,Organic* Ginkgo Biloba Leaf Extract, Organic Eucalyptus Globulus Extract***, Gluconolactone, Sodium Benzoate. I have curly hair 3A-ish, and this works so beautifully in it! It creates softness and definition yet does not weight my hair down at all. It's one of my holy grail products. Highly recommend.